Summer in the Philippines has just started. And I think I was able to start spending summer very well. Find out why. Panglao Island, an island west of Bohol Province is one of my list to unwind from the daily corporate ambient in Cebu City where I work 5 days a week. Luckily, a friend call me that I, will be part of a Bohol Tour for 3-days and 2-nights with three other Travel-Lifestyle writers from Cebu Media and fellow travel bloggers from Cebu and Manila. I am so excited for an early summer treat! And I'm even more excited when I received the Travel Itinerary which says that we will be staying in one of the famous Resorts in Panglao Island along Alona Beach, Its the resort atop of a seaside cliff - The "Little Love" Amorita Resort! We arrived at the Amorita Resort just in time for launch. We first met Amorita Resort Manager - James San Diego with a warm welcome from our almost 2-hour ferry trip via Oceanjet fastcraft and 20-minute land trip from Tagbilaran Sea Port to Amorita Resort via Amorita shuttle. After checking-in to Amorita Resort we are then treated to a Boholano Cuisine Lunch by Amorita, some of the Bohol's food treasure are chicken binakol and balbacua. Amorita's Saffron Restaurant whirls a relaxed and casual ambiance that enables you to see Amorita Resort's vast Infinity pool and as you look beyond offers the 180 degrees view of Alona Beach and Bohol Sea. The wooden antique furniture of Saffron Restaurant accomplished the all you wanted from a Al-Fresco Dining. I enjoyed having lunch on my first day in Panglao Bohol while having casual chats with co-bloggers and resort staffs. Next in line will be Amorita's In-room Massage Spa from in house Therapists. I said to myself, "this is one of my most relaxing afternoon". We stayed at the Deluxe Rooms in Amorita with two queen-size beds and spacious bathroom. It has rainfall-type shower with hot and cold fresh water. In the balcony, will treat your eyes with green vegetation of the resort. 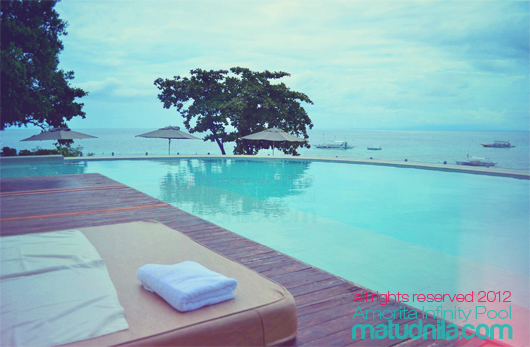 Amorita Ocean View Villas and Garden View Villas rooms are also offered. As the 1-hour massage spa set in motion, I was sent to a nap. 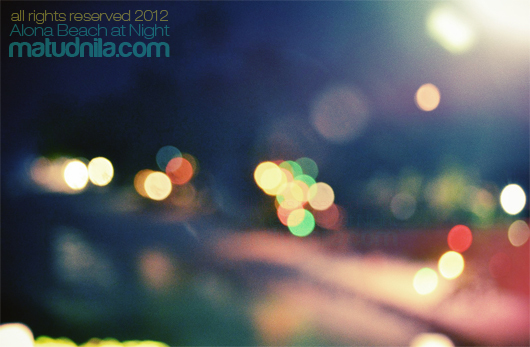 A bokeh photograph of Alona Beach at Night taken from the Amorita Viewing Deck. Deep pampered and much relaxed, I am now excite for what are in store for us in the next item in our list, The Bohol by Night Tour. Yes this type of tour is offered in Amorita Resort with partnership of European Cuisine Restaurant in Panglao. We started at the Saffron viewing deck with an appetizer then jump off to our first stop, an Italian Restaurant in Panglao - Giuseppe Pizzeria & Sicilian Roasts, Gastronomia & Wines. 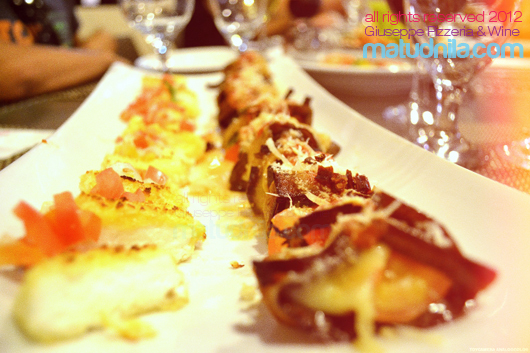 Giuseppe Pizzeria & Sicilian Roasts, Gastronomia & Wines offering. It's our first yet but my stomach is full already. Our second stop for the Bohol Tour at Night is a Spanish Restaurant in Panglao, Jugali's Bistro and one thing my taste buds cant forget was Jugali Bistro's Paella Valenciana and Paella Negra - it just so delectably prepared by Chef Jorg Linke himself. For the third stop, we had our desserts at Panglao C.U. Deli Shop where German Chef Uli offers glasses of tiramisu, frozen iced coffee, black forest cake and creme caramel. Our last stop is at the Viewing deck at Amorita Resort where sangrias help us complete the Bohol night tour. Thanks to James which guide us througout the Bohol by Night Tour. Bohol by Night needs prior reservation, for current rates, you may contact Amorita resorts. Alona Beach, breathtaking view from Amorita Resort viewing deck. Giuseppe Pizzeria & Wines can be contacted at this Phone no. +63-38-510-1217. 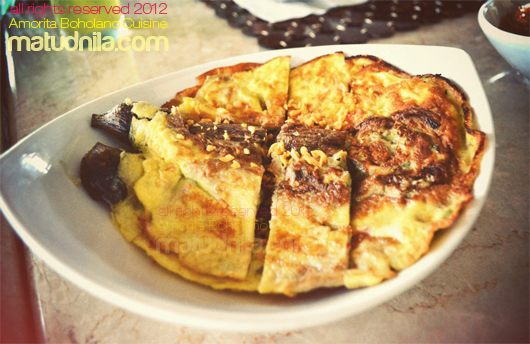 This is my Panglao Island Bohol Summer Treat Day 1, Day 2 & 3 coming up! 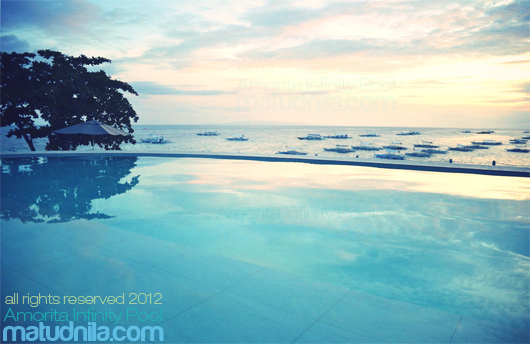 Amorita Resort Alona Beach Panglao Bohol featured at Cebu Events Blog. 0 comments: on ""My Little Love" Resort, Panglao in the Summer Island of Bohol"